After the success of the Double Elephant folio (Havells edition), Audubon wanted to make a more affordable and widespread edition. This he accomplished with the Royal Octavo edition by reducing the large engravings. The name Octavo refers to the fact that the prints would be printed on paper equal to one-eighth (octave) of a full sheet of printing paper. 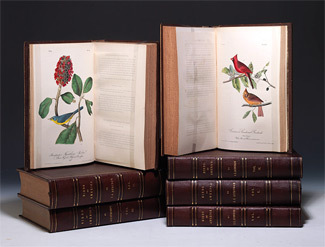 Begun in 1840, Audubon employed JT Bowen, a lithographer from Philadelphia, to reproduce the miniature edition. Audubon reduced the large original engravings using a camera lucida: an artist’s tool for reducing images. Prints from the Royal Octavo edition measure 10.5″ x 6.5″ and were originally bound into books. A total of 500 images comprise the First Royal Octavo Edition. No more than 1000 are believed to have been made. Authenticating Royal Octavos is accomplished by measuring the print. Again, the outer dimensions should be 10.5″ x 6.5″. Often one edge of the print bears signs of when it was originally bound and stitched into it’s book.